With practice, a lock pick gun can pick most locks in only seconds – definitely the fastest way to pick a lock. Our lock pick gun includes an assortment of replacement needles and enough replacement springs to complete two complete rebuilds. This lock pick gun will survive many years of use. 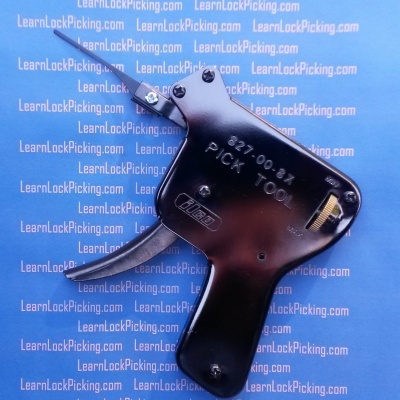 SKU: LockPickGun. 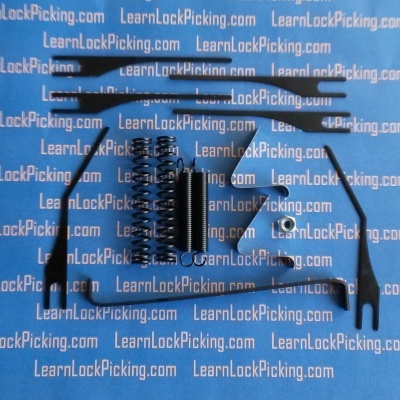 Category: Lock Picks. Brands: Ilco. If you’ve ever played pool, you already understand how a lock pick gun works. Place two pool balls on the table touching each other. Roll the cue ball and let it strike against ball number 1. Even though ball number 1 was hit by the cue ball, it won’t move. Ball number 1 transfers the impact energy to ball number 2 and it’s ball number 2 that rolls away. Lock pick guns work on the same principal. Insert the pick gun’s needle into the lock. When you pull the trigger, the needle snaps upward striking the bottom pins inside the lock. These pins transfer the impact energy to the top pins causing the top pins to rise in their chambers. For a brief instant, there will be a gap between the bottom pins and the top pins allowing the lock to be turned. With practice, a lock pick gun can pick most locks in only seconds – definitely the fastest way to pick a lock. Our lock pick gun includes an assortment of replacement needles and enough replacement springs to complete two complete rebuilds. This lock pick gun will survive many years of use.